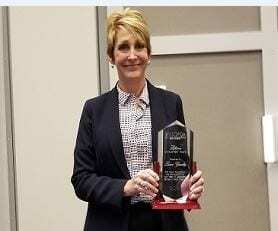 The Government of Finance Officers Association (GFOA) – Kansas awarded Laura Gourley, interim city administrator, with the 2018 Lifetime Achievement Award. According to the GFOA, this prestigious award recognizes individuals who have made significant contributions throughout their careers to the practice of government finance that exemplify outstanding financial management and who have also made significant contributions of time or other support to the GFOA. Gourley has been in Gardner since 1989 working in various capacities, including serving as the city’s finance director for more than 13 years. As director, she has upheld best practices resulting in GFOA budget and Comprehensive Annual Financial Report awards, implemented priority-based and multiyear budgets, planned and executed funding for major capital projects, refinanced debt to save the city $4.25 million, and negotiated fiscally responsible development initiatives. Gourley received this award on Oct. 11 during the 19th Annual KSGFOA Fall Professional Conference held in Olathe.